When I wrote my response, I had a hunch. 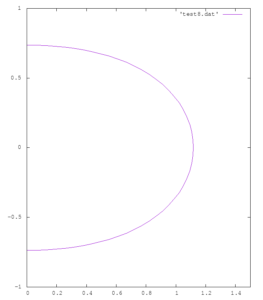 In the case of a Schwarzschild black hole, r = const actually describes a sphere, as it is a spherically symmetric solution. In the case of a rotating black hole (called a Kerr black hole, from the physicist who first derived the metric describing them) it doesn't have to be so. r is just one of the coordinates, which can be assigned to the space arbitrarily and the points with the same r don't have to lie on a sphere. In order to be sure, we have to calculate it. The event horizon (actually, two of them!) appears in the place where - so . We are only interested in the outer horizon, as it is what decides the shape of the black hole. It's not very beautiful, but much more pleasant than the full metric. What do we do, when is not 1, though? It is tempting to just call and something like latitude and longitude, but it would be the same mistake as saying that constant is a sphere - we have no guarantee that those coordinates have some physical interpretation. 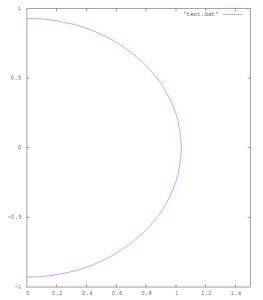 What's left is to generate a surface with an equivalent metric. (In the case of a sphere, we would have , ). Now we need to calculate the metric of our surface. The metric of a flat 3D space in the x, y, z coordinates is very simple: . We just have to limit it to our surface and express it using and . The second equation is an ordinary differential equation for - it can be solved numerically, and we will have the full description of our surface. So now - what does such a surface look like? Let's note that when we calculate for various values of between and , we get x and z coordinates of points on our surface for - so it's something like a "zero meridian". 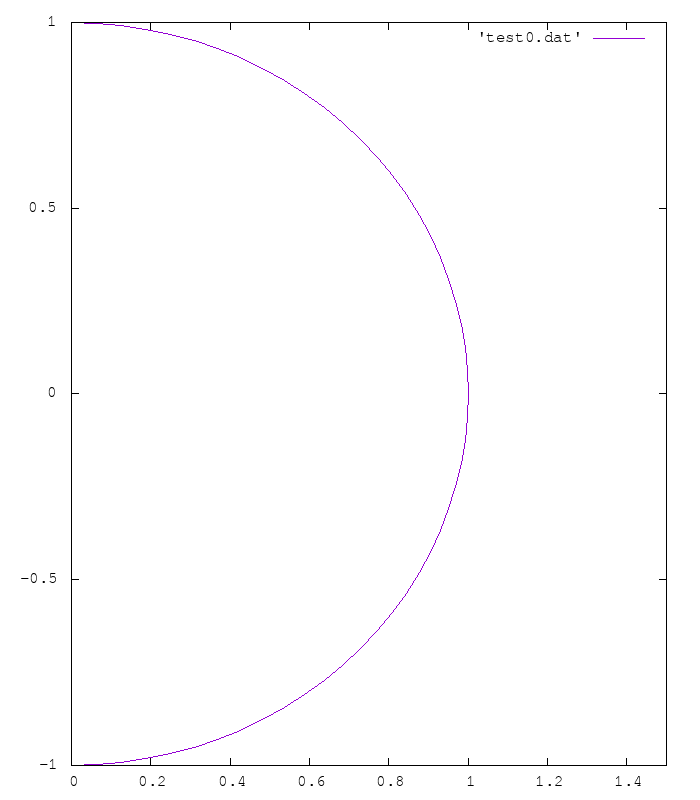 We just rotate the resulting curve around the z axis and voila! We have our surface. If you look closely, you can see some flattenning for , and quite a bit of it for 0.8. And what happens for larger values of ...? 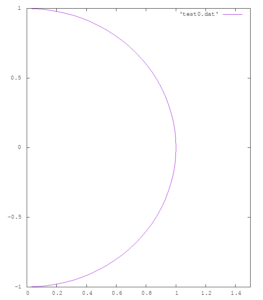 I tried to see - and the program calculating numerically started throwing complex numbers at me. What the...? I started suspecting a mistake in the calculations, so I checked them multiple times, but everything looked OK. I concluded, then, that maybe this is the correct result - but what would be its interpretation? The problem stems from the way of calculating - namely, we take a coefficient of the surface's metric that multiplies , and we subtract from it. Well, but for large enough values of , the second part turns out to be larger than the first one, and the square of the derivative of z turns out negative. But wait... what is larger than what here? The first part is a coefficient of the metric, which is basically a square of the length of the line that we draw by moving along the surface by . The second one is the square of the change in our distance from the axis of rotation when we move like that. A negative result means that by moving along the surface a bit, we move away from the axis of symmetry by more than we move along the surface - WTF? Such things shouldn't happen, should they? Well, it turns out that, although counter-intuitive, it's actually possible. The source of the problem is that we try to divide the horizon into circles - circles of latitude (constant ), and we try to "stack" them along the z axis so that the distances on the surface created that way were the same as on the horizon. However, if the geometry of space is sufficiently curved, the curvature of circles of latitude can vary in a way completely independent from the distance on the surface - and this is what happens here. 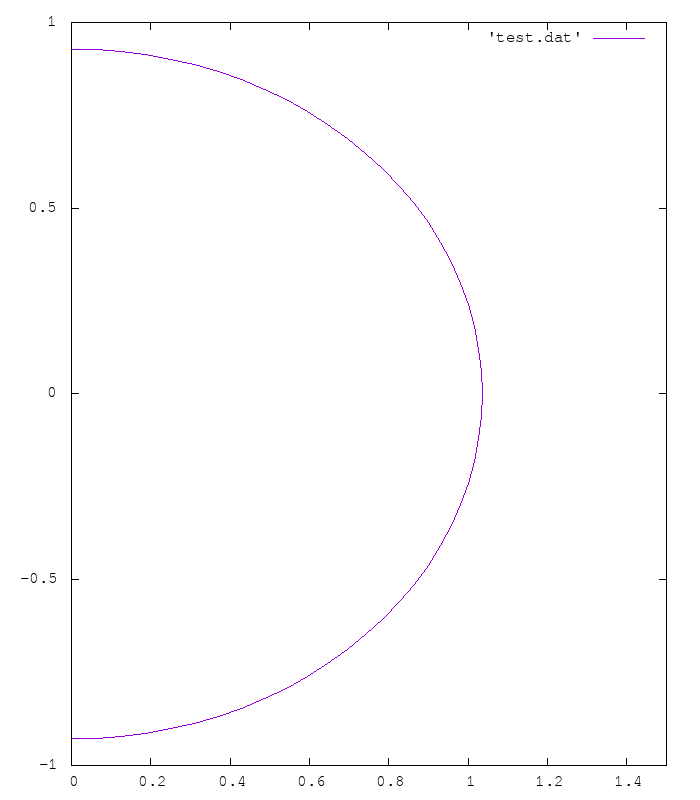 Our distance from the axis of rotation ( ) is just the radius of curvature of the circle of latitude, and it varies so fast that the distance on the surface "doesn't catch up". Such a situation is possible in a curved space, but not in a flat one - like the one we live in and try to picture the shape of the horizon. So, simply put: the shape of the horizon is something that just doesn't exist in a flat space. Oh well. We won't see what an extremal horizon looks like ( ; my master's thesis was actually about such horizons). We won't be able to see the actual shape of the horizon - but an observer near such a black hole would surely see something, right? He could take a picture and print it on a 2-dimensional piece of paper - what would be the result? 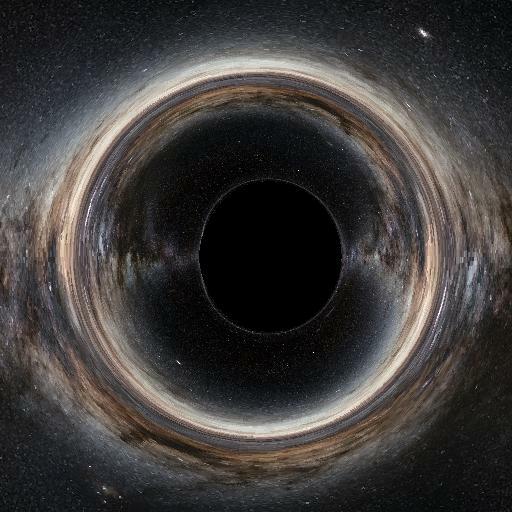 A black hole strongly deflects rays of light that pass near it, and absorbs some of them - as a result, an observer sees a black spot on the sky, surrounded by a distorted image of the background. The shape of this spot - called a "shadow" of the black hole - is not the shape of the horizon, though. It is determined by how the black hole affects light. When the black hole is spinning, light passing it on the one side is deflected a bit differently, than on the other side, which causes the image to be a bit flattened, indeed - but only on one side, and in the direction perpendicular to the axis of rotation, not parallel. 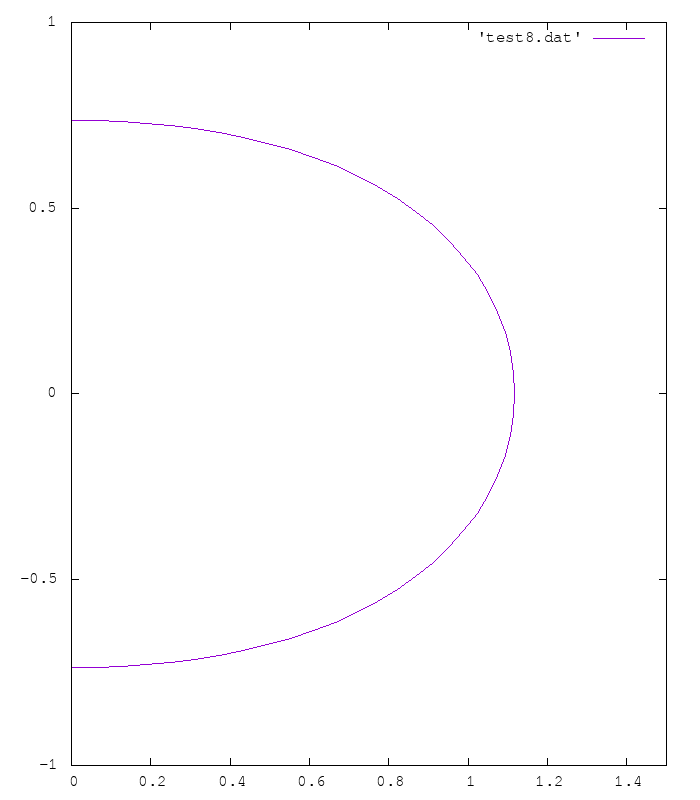 The picture below is a result of simulating a black hole with . The axis of rotation is vertical here. You can clearly see the flattened left side - caused by the fact that light on this side can pass a bit closer to the black hole without falling in, than on the other side.